Dinner tonight was supposed to look a little different. But when it was go-time, I found myself faced with a real sketchy looking mango that I couldn’t remember buying and 3 wrinkly kiwi that I could remember buying because it was the source of The Little’s real public tantrum during the busiest grocery shopping hour of the busiest grocery shopping day. The person who coined the phrase “The Terrible Twos” most certainly didn’t survive one of those epic public meltdowns to realize that the Threes are worse than the Twos. And at the end of the day, I just really wanted a real beer and a real fish taco. With a real tortilla. So one, I had. 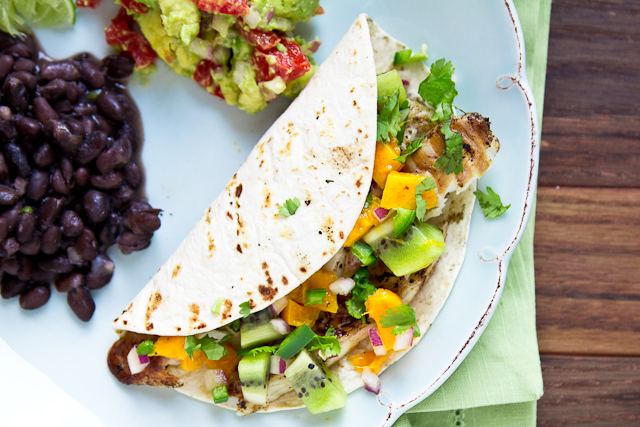 In the form of beer-glazed fish tacos topped with a kiwi-mango salsa. The beer glaze was simple – I marinated the fish in a brew from of my favorite local guys: No Label Brewery‘s Don Jalapeno Ale. Don Jalapeno is brewed with – wait for it – jalapenos. You get good muted char/roasty flavors from the roasted jalapenos and just a little heat on the back end from the fresh peppers. It’s one of those beers that’s awesome for a flight, to share, and to cook/bake with… but I find it a leetle difficult to finish the entire bottle on my own. And that’s why I got married. No unfinished beer left behind. I reduced the marinade to concentrate the flavors, drizzling the glaze over the tacos before eating. And Mother of Saint Arnold, was it fantastic. 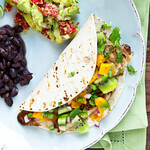 Grilled cod tacos are topped with kiwi-mango salsa and a beer glaze. Place marinade ingredients in a large zippered bag, add fish, and let sit in the fridge for 20-30 minutes. Combine the salsa ingredients in a bowl and set aside. Put the marinade in a medium sauce pan or pot over high heat, bring to a boil, and let reduce to ~1/4 cup. Grill the fish ~4-5 minutes per side, until it's opaque in the center and flakes easily. To serve, top tortillas with flaked fish, a scoop of salsa, and a drizzle of the beer reduction. Okay, so my mouth just might be watering to an embarrassing degree looking at these fish tacos. I have been craving fish tacos (blame pending Cinco de Mayo) but have never made them before. This recipe gives me such courage–and anything with mango makes me happy–thanks for sharing! Fish tacos are one of my all time favorites, and that salsa looks divine. I so want this for dinner! These are such colorful, delicious looking tacos! I love the beer-orange marinade, too! I bet your favorite ingredient was the tortilla though. 😉 Thanks for sharing! I am a fish taco freak, and these sound fantastic! I love that marinade! Love everything about these tacos.. From the beer glaze, to the tropical salsa!!! Delicious!! I love all the fresh flavor in these tacos…and I really hope I can find that beer! I’ve been thinking about these since you teased us on Instagram. You know I need them in my life! And, we could def use a fresh spin on a fish taco too. Can’t wait to try! I love everything about these tacos! And that kiwi mango salsa is pure genius! The tacos look great! My kids are older now (youngest is 17) but I always thought age three was a lot more difficult than two. Hang in there! Once they are in school time goes so fast. Wow these look soooo good! I’m always on the lookout for a good fish taco and I think I may just have to move these to the top of the list! These sound fantastic..I love fish tacos, and beer marinated? genius! so pretty! Ive been starting to get into some tantrums with my son and am totally dreading the public meltdowns that are sure to come! They look awesome! I am making them for dinner tonight. The terrible twos lead into the the why? and try years. It is definitely a challenging year. They question everything and do want to try things but not necessarily new food. Just remember that this is all part of their learning and growing and patience is a prerequisite. : )) Enjoy them while they are little because they grow up really fast. Hi – We actually found that the mango really overpowered any other flavor in the taco. We couldn’t taste the glaze at all and only tasted the fish when we didn’t get any mango in the same bite. Sorry.